Nella Genkina graduated from the State University of Nizhny Novgorod. She holds a degree of Candidate (CSc.) in physics and mathematics, as well as a title of Honorary Inventor of the USSR. Nellastudied painting at the Nizhny Novgorod College of Arts. She is member of the Russian Creative Union of Artistsand of the International Arts Fund. Nella‘s works were included in ‘1000 Russian Painters‘, a compilation project by Bely Gorod publishers. 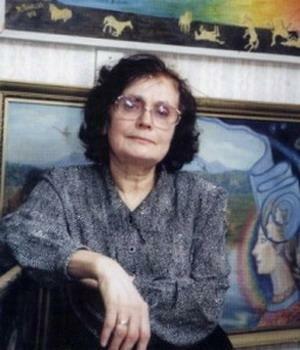 Her paintings are exhibited in a number of museums in Yaroslavl, Luhansk, Rybinsk, Gorodets, and Moscow. With more than 15 individual exhibitions held in the cities of Nizhny Novgorod, Moscow and Helsinki, Nella also participated in group shows in Rybinsk, Nizhny Novgorod, Moscow, and the Philippines, including the nation-wide ‘Millennial Russia‘ in 2003. Nella‘s works are displayed in a number of public entities including the Accounts Chamber, Nizhny Novgorod Public Library, State University of Nizhny Novgorod, Moscow State University, privately held companies such as Lukoil and the National Gas Company, as well as in private collections both in Russia and abroad. The principal themes of Nella‘s paintings are historical portraits, Slavic mythology, and seascapes. During her career in arts, Nella was awarded the Order of Vladimir Dal, Order of Prince Yaroslav the Wise, and medal for the contribution to the Russian culture.